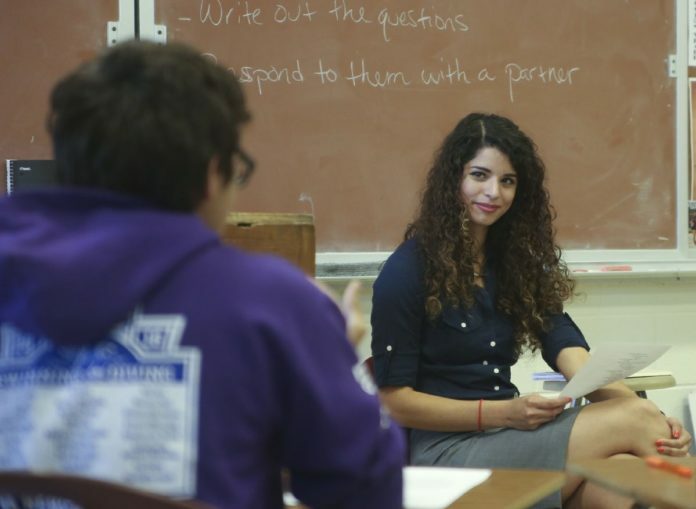 Mission High School teacher Victoria Rojas leads a Mexican-American studies course in her classroom. McALLEN — The Texas State Board of Education is once again opening the floor to discussion regarding Mexican American Studies. This time the agenda item calls for a discussion on possibly creating standardized curriculum, and Rio Grande Valley educators are once again voicing support. “The reason why we need Mexican American Studies to be taught and incorporated into the school districts and schools in Texas is to assert the important value Mexican-Americans and Latinos in general have contributed to the state of Texas and the United States,” said Trinidad Gonzales, history instructor at South Texas College and member of the National Association of Chicana Chicano Studies-Tejas Foco Working Group. The board is meeting this week to discuss a variety of issues, and on Tuesday they will open the floor to testimony from those for and against the creation of Texas Essential Knowledge Skills, or TEKS, which Gonzales argues would not only create safeguards for students who would learn the same across the state, but also much-needed guidance for those creating textbooks on the subject. Gonzales was part of a committee that examined the number of students taking this courses though different avenues throughout the state. The committee found that 454 students took MAS courses during the 2016-17 academic year, either through dual enrollment courses or as an “Innovative Course,” of which the curriculum approved by the Texas Education Agency in 2015, and can be adopted by school districts to offer as an elective. The innovative course curriculum could be used as a base to create the TEKS, he said. A working group, such as Tejas Foco, could also aid in the creation of these. In the Rio Grande Valley, Gonzales was one of the first to begin offering it as a dual enrollment course in the Mission school district. This avenue uses the special topics pathway to offer the course. While this is another viable avenue, he said by creating statewide standards to follow they would ensure every student in Texas is gaining the same knowledge. Juan Carmona, U.S. History teacher at Donna High School, has the largest number of students enrolled in a dual enrollment MAS class in the Valley, which he has been offering for three years. Carmona uses the special topics avenue for now, but will be traveling to Austin to testify before the state board on Tuesday on behalf of the creation of the TEKS. When it comes to teaching, Carmona said having the TEKS as guidance would be beneficial not only to encourage more districts to pick up the course, but to also set standards for textbook manufacturers on what the students are expected to learn. There have already been issues with textbooks mainly dealing with subject matter being considered racist remarks or that’s plainly inaccurate, which Carmona said could be avoided if there is a statewide standard. The item calls for the opportunity for the committee to discuss adding TEKS for a course in Mexican American Studies. But a vote is not expected to take place at these points as the agenda calls for review and comment on the item only. Carmona said he is hopeful that the conversation is being framed in this way could mean they are getting closer to recognizing the need to set the bar for what students are learning in the classroom when it comes to this item. Gonzales said he hopes the board recognizes that there are school districts that want to teach this course but don’t have the resources needed to create the curriculum or avenues to offer it as a dual enrollment.